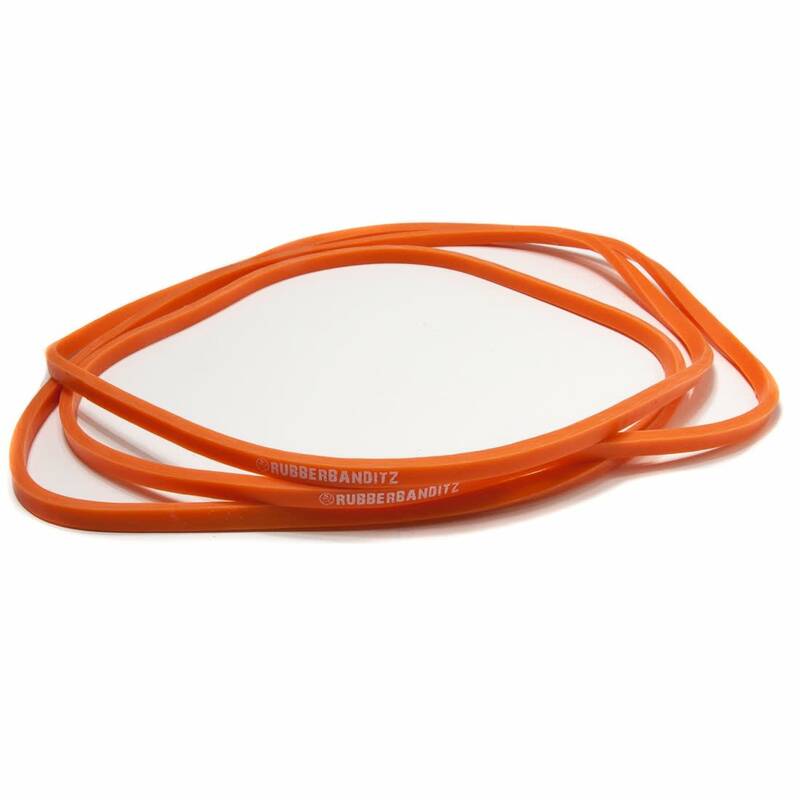 Each resistance band offers a different amount of tension, depending on the thickness of the bands. A thicker band will be harder to push or pull but will give you more assistance if using it for assisted bodyweight training (such as pull-ups). Below is a description of each band along with the corresponding dimensions. Let us know if you are having trouble making a selection. The Light Band is only 1/4" wide but has several applications that make it an extremely valuable training tool. At 1/4" thickness, it provides between 5-15 lbs. [2-7 kg] of resistance and is excellent for high rep strength training, dynamic stretching, and prehab/rehab exercises. These are one of the best tools for warming up and strengthening smaller muscle groups, particularly the shoulders and arms. The Medium Band is a highly versatile 1/2" wide band that can be used for almost every muscle in your entire body. It provides 20-35 lbs. (9-16 kg) of resistance, an ideal amount of tension for high rep toning exercises that target both upper and lower body muscle groups. 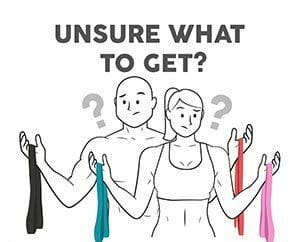 The medium resistance band can easily be combined with heavier bands to optimize the amount of assistance needed for pullups, pole fitness, powerlifting, and a variety of strength training and stretching exercises. The Heavy Band measures 7/8" wide and provides 30-50 lbs. (14-23 kg) of resistance and offers numerous ways to tone and strengthen your entire body. Our heavy band's versatility makes them valuable for assisted pull-ups, pole fitness, powerlifting, squats, presses, and numerous stretches. This heavy duty band can be used alone or can easily be combined with another band to tailor the amount of resistance needed. The Robust Band is our most popular band for assisted bodyweight training (assisted pull-ups, pole dance fitness, and calisthenics). With 40-80 lbs. [18-36 kg] of resistance the 1.15" Robust Band is a versatile jump off point for many suspended movements found on the pole and pull-up bar. Fasten it securely and dramatically improve the quality and quantity of your: assisted pull-ups, muscle-ups, shoulder mounts, and handsprings. Harness the resistance by stepping inside for a deep stretch or squat, or strap them to a barbell and amplify your presses and deadlifts with the band's ascending resistance. The Power Band is our silver bullet for assisted pullups and is widely used as a spotting pal and training enhancer on the pole or barbell. It measures 1.75" in width and provides 50-120 lbs. [23-55 kg] of resistance. This heavy duty band has become a staple on the pullup bar in bodyweight training communities, in CrossFit gyms, and on powerlifting racks when used in conjunction with free weights. Need a spot for inverts or for the illustrious iron-x? 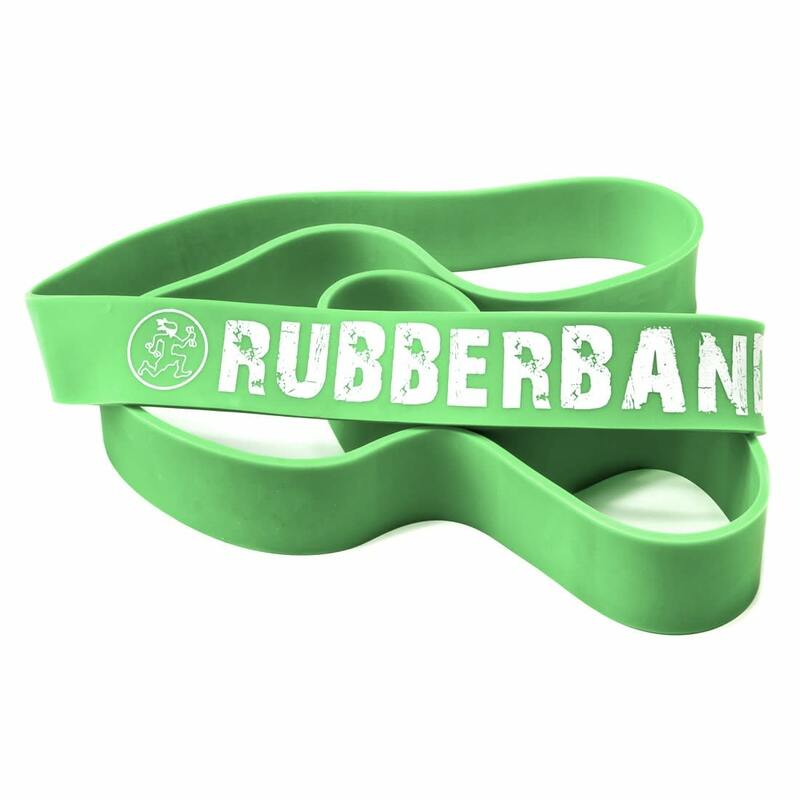 The mighty green band has your back and bottom! The Strong Band is the beefcake of bands. It is 2.5" in width and provides 60-150 lbs. (27-68 kg) of resistance. Hang this band from the pullup bar for a generous pull-up assist boost or for suspended inversions. These pullup assist bands are recommended for adults >250 lbs. The substantial tension also makes this band a viable option for supercharging weighted squats by adding 200+ lbs. 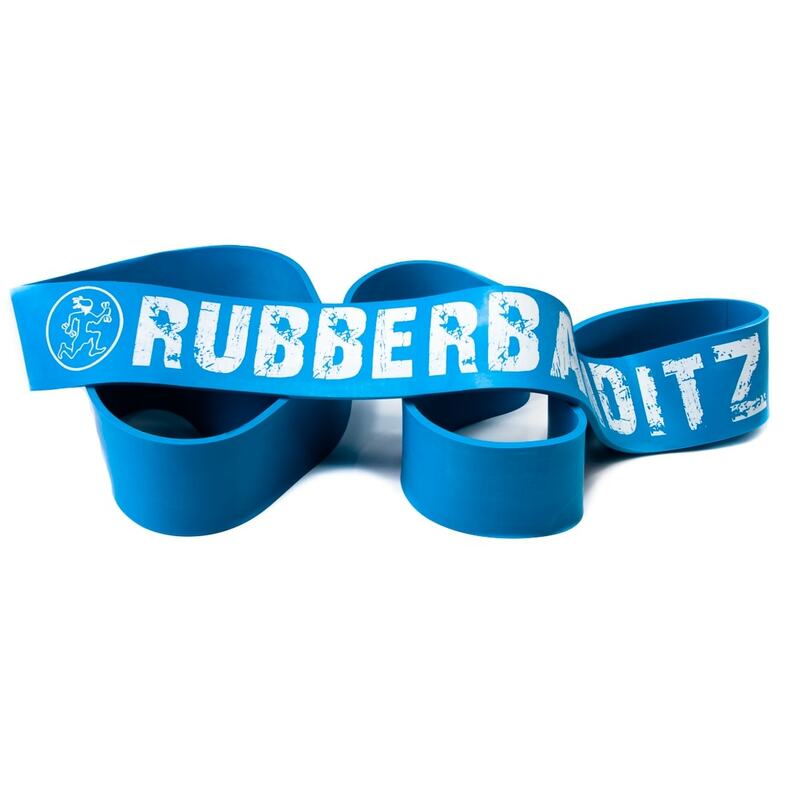 of elastic ascending resistance throughout your range of motion when using one of these burly bands on either end of a barbell. The Monster Band measures 4" across and is the granddaddy titan of tension. This band offers up to 80-200 lbs. (36-91 kg) of resistance for herculean humans. This band is no joke! If you are not a seasoned powerlifter or think you may need to start with a lighter band, then you probably do. The colossal size of this band makes it applicable only for heavyweight squats and suspended inversions -- popularized by Donnie Thompson (world powerlifting record holder). How are our bands different? 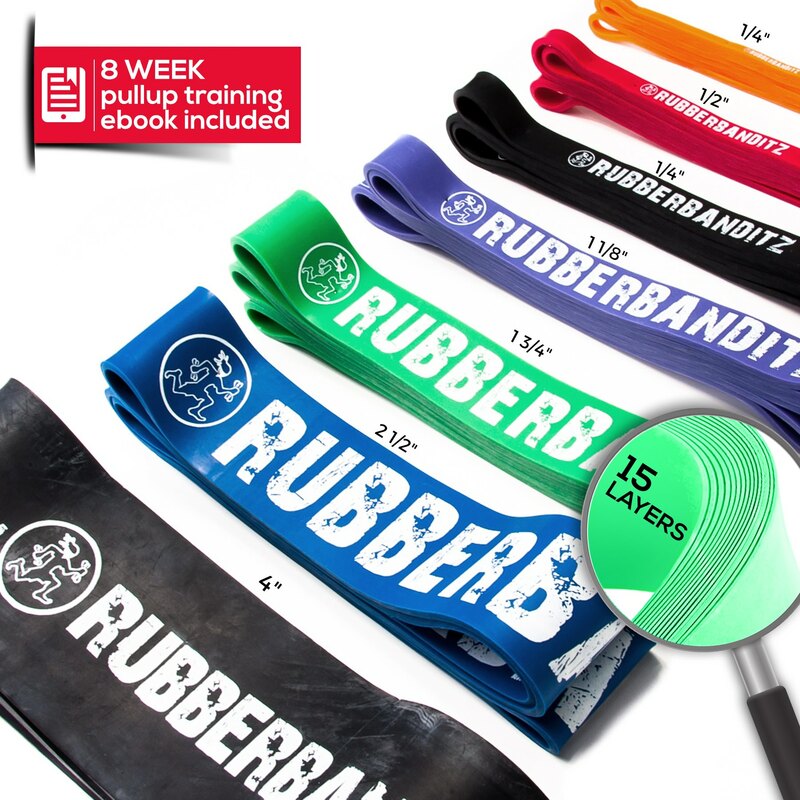 Unlike most bands, which are made in a large factory and cast as a solid piece of rubber, our exercise resistance bands are made of premium Sri Lankan latex and crafted through a multi-layering process, like the way a roll of tape is wound up. *Each band is 41" [104 cm] in length and is made 99% free of soluble proteins (latex allergens). THE Resistance on this and other bands doesn't quite match what is listed in the table below. For this band the description above lists "90-120 lbs" -- the table lists "60 to 150". which is the correct range? 60-150 lbs is correct. We've fixed the page so it's consistent. Thanks for pointing that out! Which band strength would you recommend for mobility exercises such as at 2:10 in the video linked BELOW? P. S.: Sorry for THE allcaps. For mobility stretching type of work, we recommend either the orange/light or the red/medium band. Our product selection guide - https://www.rubberbanditz.com/which-band-is-right-for-me/ - can help you choose which product is best for your specific exercises and strength level. 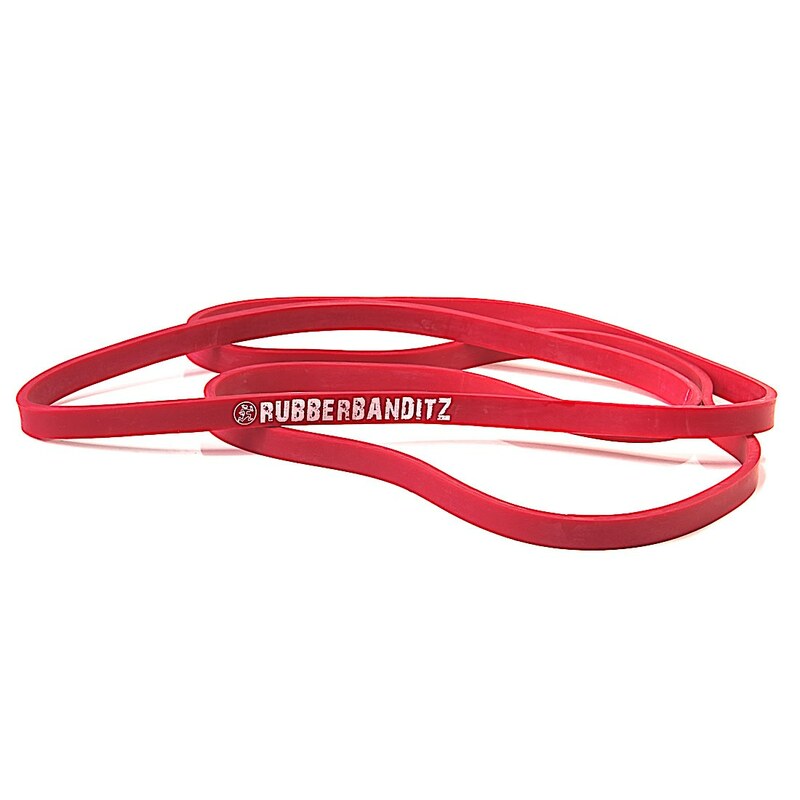 I love my rubberbanditz. I am working towards doing unassisted pull-ups and this has been a huge help!! 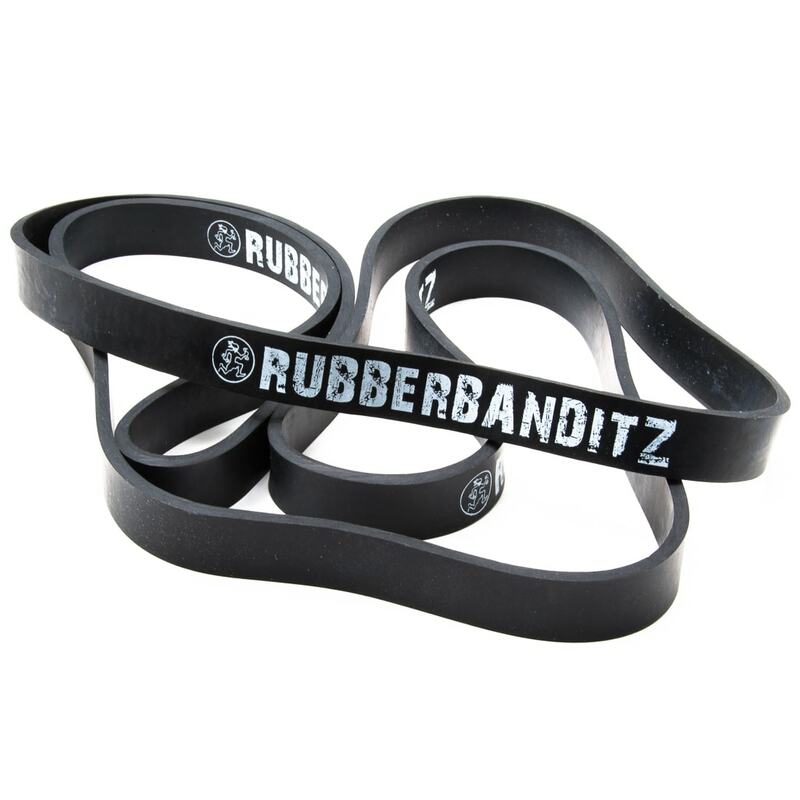 So happy I found rubberbanditz! 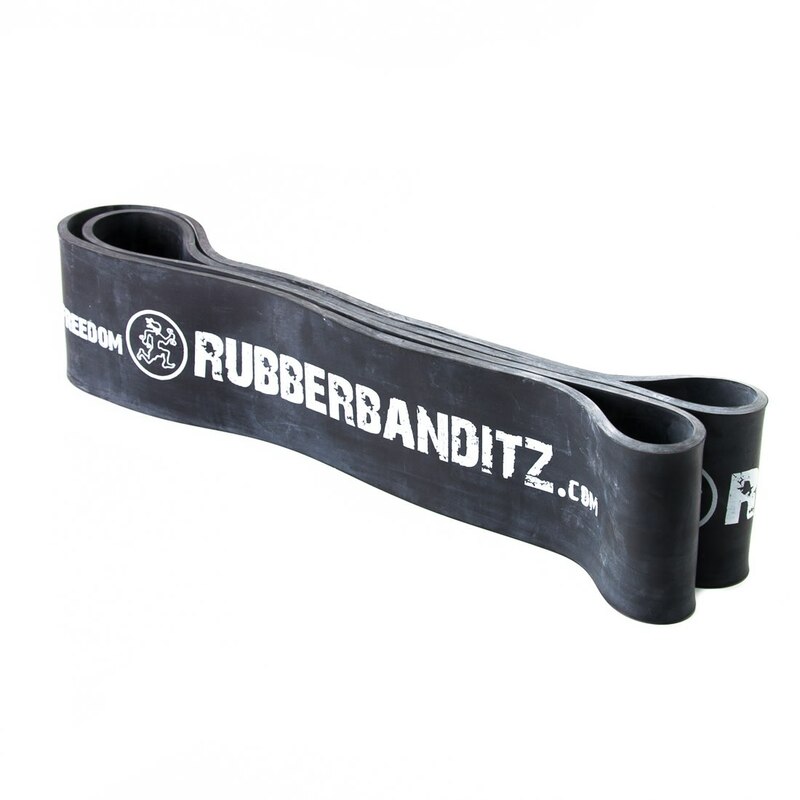 Started working out and was unable to do any pullups, tried the chair method but it wasn\'t working well, one day searching the internet I came across rubberbanditz and they really do help you get over the bar! I hope in time I will be able to do unassisted pull ups! I have ordered light, medium and heavy bands. They are all great. They got here fast and the customer service at Rubberbanditz is the best I've ever seen. great way to get a good stretch anywhere, even fits in my pocket!